Expressions like “spacious and textural” are generally used to describe the music of “Implodes”. Ambient psychedelia also seems to be a fitting descriptor. The Chicago quartet, of Ken Camden,Matt Jencik, Emily Elhaj, and Justin Rathell indicate on their Facebook page that music they like includes Geffika, Ga’an, Brain Idea, Disappears, Belong, Mayor Daley, Violent Arp Band, Cleared, Alice Coltrane, Joy Division, and Black Sabbath – of which I am aware of four of said list and will be scurrying off to the internet to investigate the others in due course. Not that the known stuff on the list gives you many clues as to what to expect. 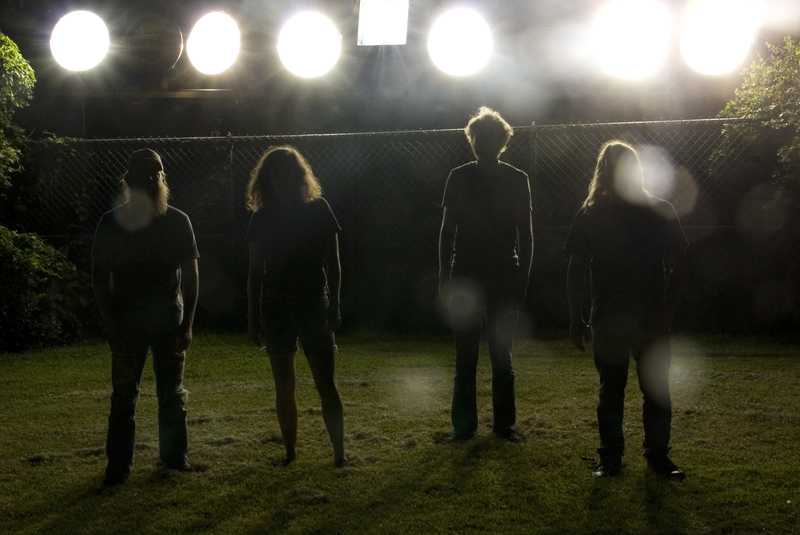 The band made its debut in 2009 with the release of a self-titled cassette before issuing “Black Earth” on Kranky in 2011. Time then for the second album. 45 minutes long and all rather marvellous I have to say. I do like bands that challenge my preconceptions about what modern rock is supposed to sound like. The ambient surges/drones of the opener “Alice” set the tone for what proves to be an immediate and pleasurable listening experience…..it’s a short piece but gets you in the mood for what is to follow. “Scattered In The Wind” hangs between post-punk and post-rock and drives along at a measured pace as dual vocals float in a reverb fog over inter-meshing guitars as a variety of riffs and tones fly back and forth across the sound-scape. Hypnotic repetition is at the core and there is a similarity to the orchestral feel of ASMZ and GS!YBE as well as Moon Duo/Wooden Shjips. “Sleepyheads” does what is says on the tin – a sort of dream-pysch ramble – this is followed by the epic “Necronomics” which is a full tilt wall of sound job. Imagine a MBV album where the guitars don’t take over and the overall feel is more sensual. This is pretty dark stuff, but at the same time alluring, almost a musical succubus. “Zombie Regrets” is another ambient piece – surging guitars/synthesis creating layers of mesmerising sound….”You Wouldn’t Know It” is pretty dark stuff, a simple riff and rhythm with extreme reverb on the vox creates a spooky sensation, again repetition is the watch-word as visceral sounds float in and out and the whole thing mesmerises the listener into abject abeyance. “Ex Mass” is lovely, all Edgar Froese synthy and pastoral guitars….until the wall of sound guitars crash in with Menuckian fervour…..and it becomes a fascinating mix of post-rock and shoe-gaze. “Dream Mirror” is a brief ambient interlude with synth surges/washes/pads floating somewhere in the ether. The closing trio of “Melted Candle” , “Prisms and the Nature of Light” and “Bottom of a Well” demonstrate that the band show variety in their writing moving as they do from mammoth post-rock slabs of noise, through wistful pastoral strumming, to apocalyptic psychedelia with a wonderful interlocking guitar coda. Having said all that – my words tend to fall short of describing the quality and essence of emotion captured in these eleven tunes. If you like post-rock with a hint of shoegaze, psychedelia and a sprinkling of post-punk dystopia then you will love this. I know I did. Posted on February 22, 2013 by HalfEdgeMediaPosted in Album ReviewTagged Implodes. Next Next post: Like ….well Love Actually…..